The University of Maine professor envisions a new business sector that could transform the state. ORONO — Less than 24 hours after returning from a wind energy conference in Dallas, Habib Dagher was sitting in front of a video monitor here at the University of Maine. Looking back at him was a manager at Statoil, the global energy company in Oslo, Norway, that’s a pioneer in offshore wind power. Midway through the teleconference, Dagher left the room. Climbing the stairs — two at a time — he entered a meeting with the director of a British firm that makes composite molds for wind turbine blades. 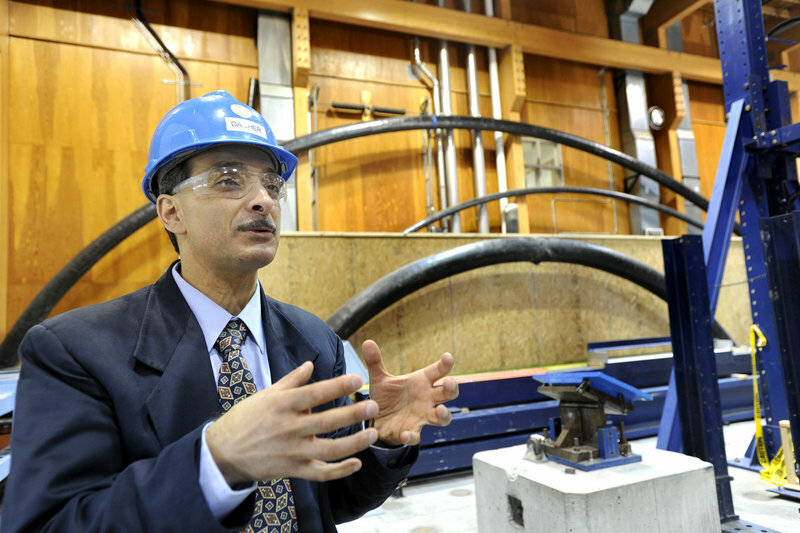 This pace and sense of urgency is typical for Dagher, a professor and founding director of the university’s Advanced Structures and Composites Center. He has become the state’s point man for what some see as a once-in-a-generation opportunity — creating a major new business sector around offshore wind energy. Dagher offers this analogy: Developers came to Maine at the dawn of the 20th century to exploit the state’s rivers and forests — and its proximity to markets — to build an industry around pulp and paper. Now global companies are looking 20 miles offshore at Maine’s steady breezes, and its closeness to Northeast cities, to develop an industry around floating wind power. But power production is only the start, Dagher says. Maine could launch a new manufacturing sector to build and service the components of deepwater wind. That could lead to billions of dollars in investment and thousands of jobs. This evolution, Dagher believes, would be “transformational” for Maine. If this vision has any chance of becoming real, the next several months will be pivotal for Dagher, the composites center and by extension, the state of Maine. Voters on Tuesday will decide whether to approve an energy bond that would help fund the country’s first offshore wind demonstration site, probably off Monhegan. On June 14, U.S. Energy Secretary Steven Chu will come here to tour the composites center, which has received millions of federal dollars for a major expansion to test and manufacture offshore wind components. In September, the state plans to send out bids to build the world’s first floating, commercial wind farm off the Maine coast. That site has yet to be identified. These events help explain why Dagher is spending so much face time with decision makers who are considering whether to invest in an offshore wind industry in Maine. Dagher is an engineer, but he promotes offshore wind with the skills of a seasoned politician. He is engaging and persistent. He can communicate a grand vision in simple terms. He makes people feel special and important. Dagher has won the confidence and admiration of some of the state’s top business and political leaders. Some of the state’s harshest critics of land-based wind power say they support what Dagher is trying to do offshore. It’s too soon to say whether deepwater wind energy will become a new industry in the United States, and whether Maine can gain a competitive advantage. But more than any single person, Dagher has helped put Maine in the game. Video conferences between Maine and Norway have become weekly events, and they’re an example of how the state is jockeying for position. Statoil is testing the world’s first full-sized floating wind turbine off Norway. Dagher and Gov. John Baldacci saw it last year on a trade mission. The company has a working agreement with the state, and Dagher is optimistic that Statoil will bid on Maine’s pilot project. But Statoil has concerns about doing business in the United States. The proposed site is in federal waters. Developers would need a permit from the Minerals Management Service, which took more than seven years to approve a yet-to-be-built, shallow-water wind project off Cape Cod. It’s also the agency under fire for lax oversight of the BP oil rig that’s fouling the Gulf of Mexico. Uncertainty over regulatory hurdles in the United States, Dagher said, is “the Achilles heel” for Maine’s ambitions for deepwater wind. Patched in to the recent teleconference was Karin Tilberg, Baldacci’s senior policy adviser. Tilberg briefed the Statoil officials on details of a new effort in which the feds are working with Atlantic states to speed up the review process, aiming to shrink it to three years. This coordinated approach would apply to pilot projects off Maine, Rhode Island and Delaware. Construction in Maine could potentially start in the winter of 2014, Dagher calculated. He and Tilberg talked about what it will take to meet that time frame. “There’s a really strong interest here in making this work,” Tilberg told the Norwegians. Upstairs, Dagher walked in on a slide presentation with members of his team and a director from Solent Composites Systems, a British company that makes molds for turbine blades. Dagher is interested in the company’s technology. One goal of the new lab at UMaine is to use robotics to speed the process of building and testing 200-foot-long turbine blades. That could allow the United States to make high-quality wind components that compete with the low labor costs of China and India, big players in wind energy. Also at the table were executives from Kenway Corp. in Augusta, a custom composites fabricator. 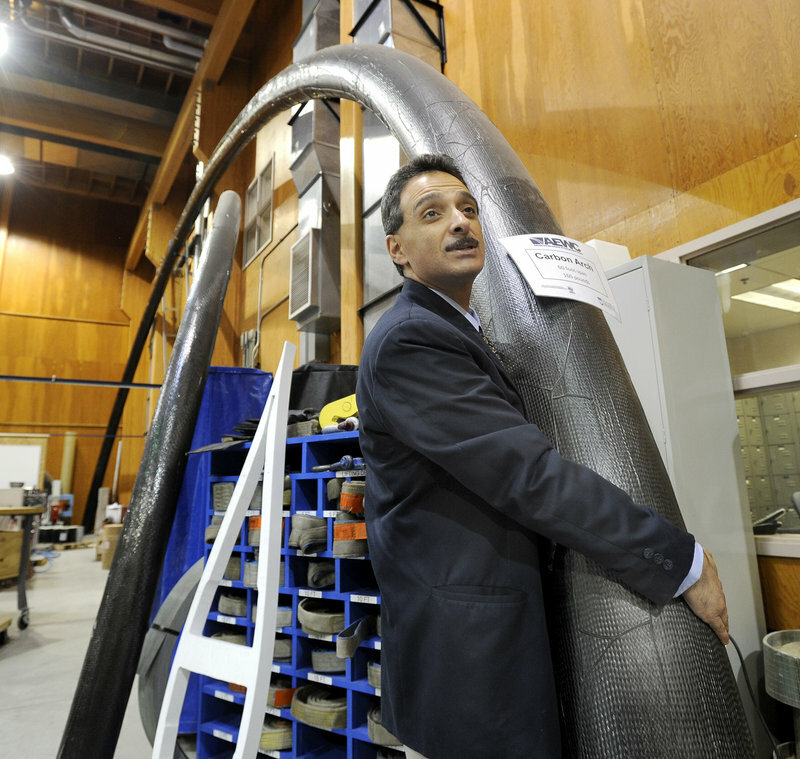 The company is using technology patented at the university center — inflatable composite forms that are very light and strong — to make bridge arches. It eventually wants to make turbine blades. “When you look around the table, you can see your customers,” Dagher told the British executive. This technology also could anchor offshore, floating turbines. 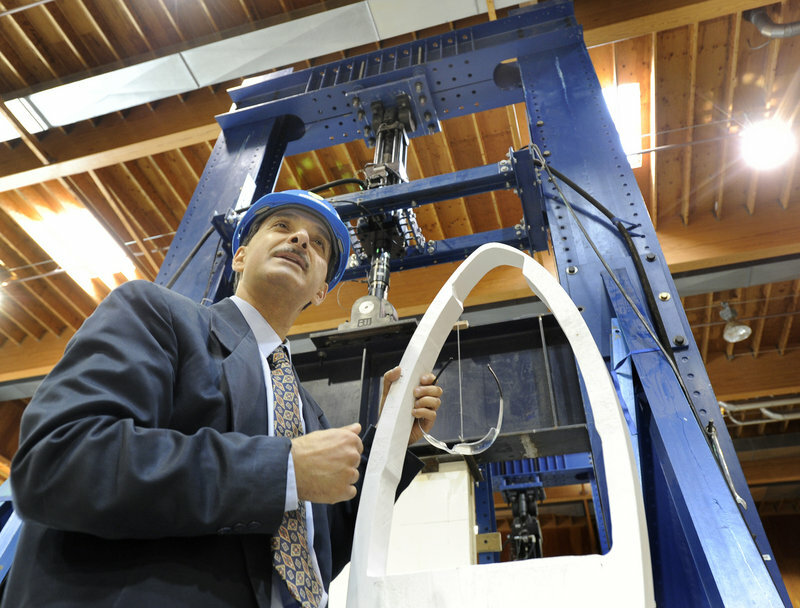 Downstairs in the existing test lab, Dagher lifted one end of a 60-foot composite arch. The entire span weighs 160 pounds; a steel or concrete arch would weigh 50,000 pounds. Dagher will offer a similar demonstration next week to Chu. The lab is gaining a worldwide reputation for developing new applications for hybrid composite materials, including better boat hulls and lightweight panels that protect soldiers from bomb blasts. “I’m trying to tie all that we’re doing here to offshore wind,” he said. The composites center was set up to help the state’s wood products industry. A few years ago, it began testing wind turbine blades. That led Dagher to think about the potential for wind energy in Maine, and visit project sites in Europe. Europe has a mature industry based in shallow water. It’s expanding offshore now, on such a massive scale that it has been called a third industrial revolution. What if Maine could tap its boatbuilding and composites expertise to build strong, lightweight components to float in the Gulf of Maine? They could power the Northeast, and be far enough offshore to dampen opposition from coastal residents. His vision is shared by Collins, who first toured the composites lab in 1997. She since has supported federal grants worth $26 million, and is asking for an additional $20 million in future funding for deepwater wind energy development. Dagher also works closely with Peter Vigue, president and chief executive of Cianbro, the state’s leading construction services company. Cianbro is a member of the DeepCwind Consortium, a university-led group of businesses that are collaborating to develop offshore wind in Maine. Dagher has brought a lot of credibilty to the process, Vigue said, which has been crucial in building relationships with global energy companies such as Statoil. Dagher, who is 50, grew up in Guinea, the son of Lebanese parents. He came to the United States to study and ultimately received his doctorate in structural engineering from the University of Wisconsin at Madison. He married a woman from there, and the couple landed in Maine in 1986, after Dagher applied for a position at Orono. Maine seemed comfortable; it reminded his wife of Wisconsin. They now are raising four school-age children. As Dagher develops a national profile in the wind energy world, questions have been raised about his commitment to Maine. He acknowledges he has had opportunities to move on to higher-paying positions in academia or the private sector. When asked how much he earns at the university, Dagher said he wasn’t sure. He had to ask his assistant to look it up — $148,048 a year. But Maine is where he wants to be now. His family is happy here, he said, and his pursuit of an offshore wind industry has morphed from a job to a mission.